SRM sponsored triathlete, Michael Weiss, was crowned the Ford Ironman Cozumel Champion on Sunday 1st December 2013. Along the way he produced the fastest bike split of the world class field by the impressive margin of 12 minutes and then went on to run the third fastest run split. Certainly Michael’s mountain biking background and pedigree as a former Olympian, European U23 Champion and World Xterra Champion translates directly to his ability on the triathlon bike. 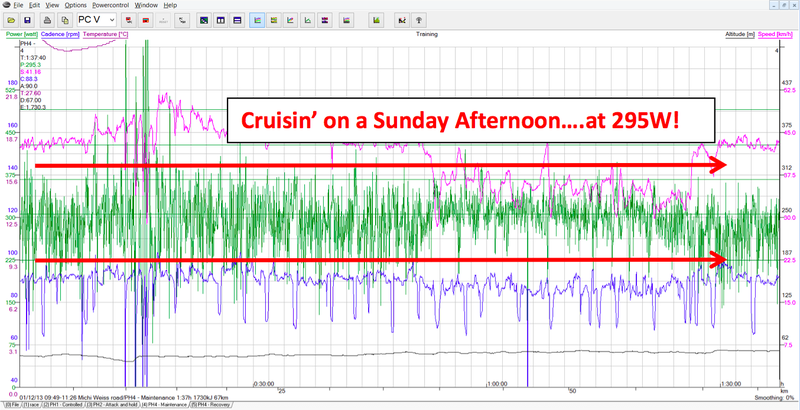 However, the SRM file also clearly shows a highly controlled and strategic racing brain in action, as I will explain. The file above is of the entire bike leg. 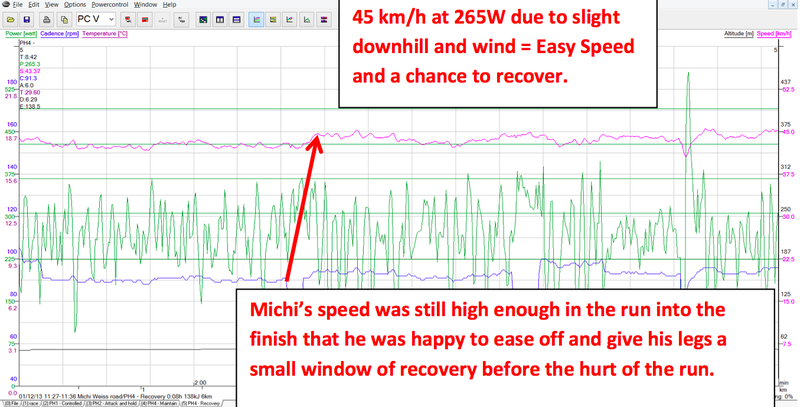 For 4hrs20mins Michi averaged a remarkable 311W and speed of 41.5 km/h. Cadence was a steady 88-90rpm and energy consumption came in at 4850KJ. 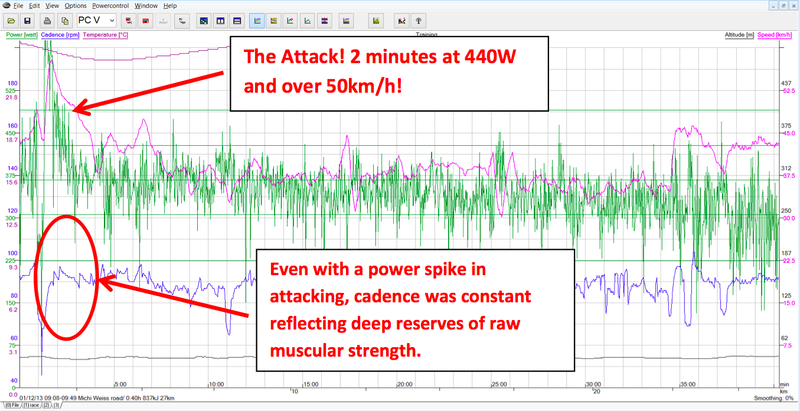 While this power output is very high when compared with what most age group athletes are able to produce, it represents only 76% of Michi’s Critical Power (sustainable threshold) of 408W which we recently tested him at in training and so represents no more than a controlled endurance/tempo effort for the duration which helps enormously in the sparing of precious glycogen stores. 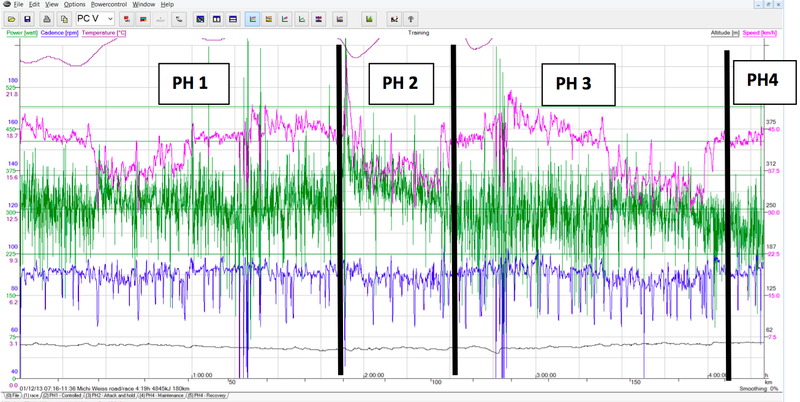 Indeed at this power output Michi’s genetic ability to continue to use a large proportion of fat as a fuel source is a key to his prodigious ability as an endurance athlete (this ability can be improved through specific and targeted training and ambitious age groupers should take note!). The overall impression of the file is of a steady controlled effort and very little ‘jumpiness’ in the way the power was metered out, as indicated by the narrow dark green power trace. 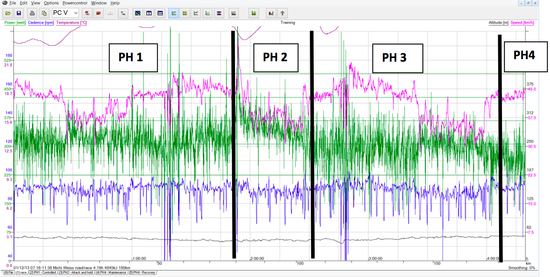 This is exactly what we would expect to see from an athlete who has developed a very high level of motor control and efficiency in his pedalling technique from countless hours spent in the saddle especially on the mountain bike where superior pedalling technique is essential to maintain traction and produce peak power rapidly. PHASE 1 was all about patience and confidence. Michi is arguably triathlon’s strongest cyclist and this means that even if he exited the water 4 minutes down on the leaders Frommold and Skipworth and 2 minutes down on Vanhoenacker, he would not be at a significant disadvantage for long as his superior race pace would naturally put him back in touch with the leaders. As we can see above, during this phase Michi did not panic and push himself into anaerobic territory which would have certainly hurt his run split, but simply dialled himself straight into his 310-320W race pace comfort zone which he was well trained for and let his speed of 42.5km/h reel the leading group in. This allowed him 80km of steady riding during which time Michi relaxed (as much as is possible while riding at 315W!) and precisely nailed his race nutritional strategy – carbohydrate and fluid intake setting himself up for a solid run. PHASE 2 – The Attack! PHASE 2 – The Attack! In the days before the race, Michi had researched where the best point on the bike course would be to launch an attack by taking into account areas of highest windspeed and relative gradient. This was the spot! 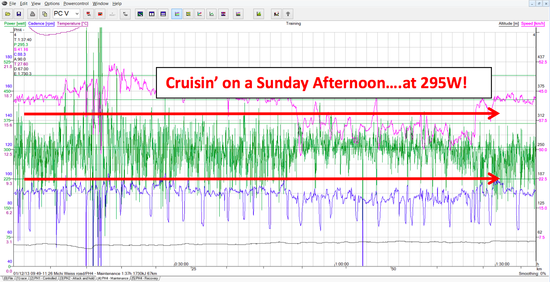 The power output of 440W which he maintained for 2 minutes was actually considerably below what we had been practising in training where he had been doing repeats of 500W+ and holding for slightly longer before returning to a wattage slightly above his race pace comfort zone so as not to let the now dropped group, get back on his wheel. This worked out perfectly in race conditions with the result that Michi was now leading the race at the 80km mark. 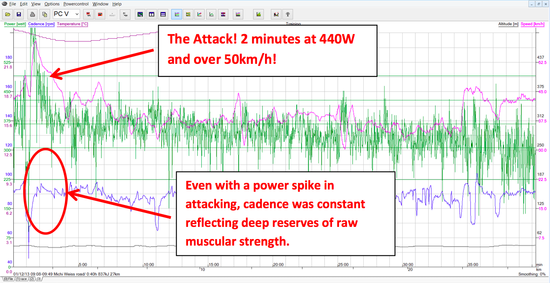 One point of interest is that during the attack, Michi maintained cadence at 88-90rpm inspite of a 50% spike in power output. This is a testament to Michi’s reserves of muscular strength which has certainly been underpinned by a new strength and conditioning programme we introduced over the last 2 years – again, age group athletes take note! PHASE 3 – Cruise Control. 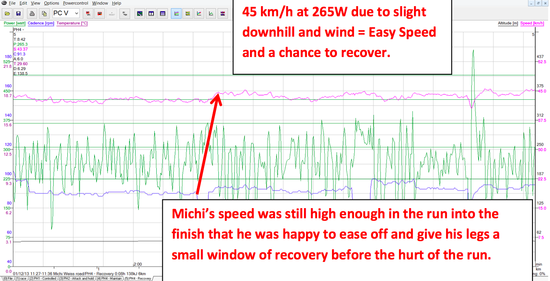 For the following 70km/h Michi dropped power output to a comfortable 295W (for him – although he was not wearing a heart rate strap his HR at this intensity does not even reach 140bpm!) and simply let his speed dictate power output. This is because at the pro level over a flat course averaging 41km/h is still going to be enough to keep you out front if the athlete can sustain that speed. Indeed this proved to be the case as Michi continued to put time into his rivals even though they working together rather well within the chase group. 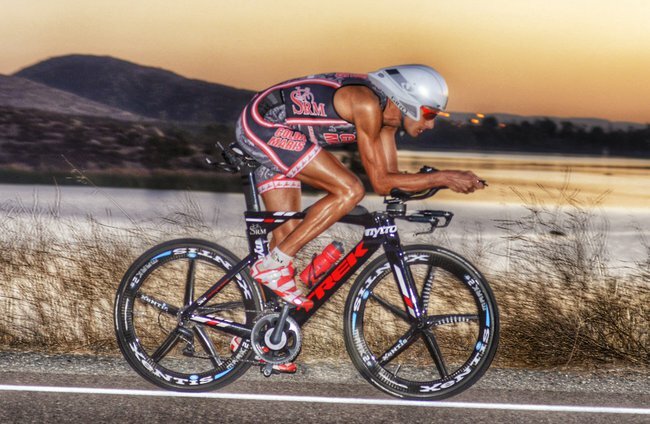 One interesting insight here for age groupers is that Michi has worked hard on his bike position (shorter cranks, steeper seat tube angle, lower front end and maintained hip angle) resulting in better aerodynamics with no real loss of power at threshold. 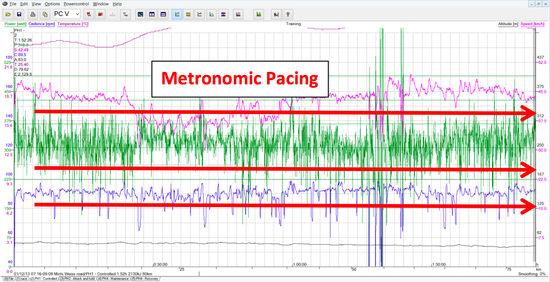 Again, age groupers take note – aero improvements always need to be made in relation to their metabolic consequences. PHASE 4 – Easing Up. PHASE 4 – Recovery. 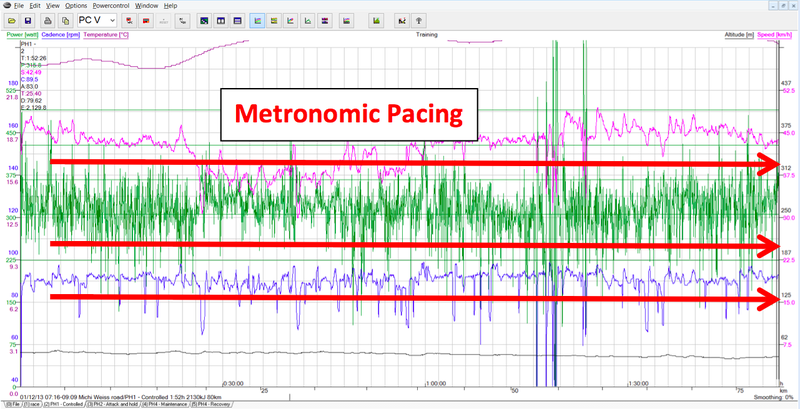 In the last 8-10 minutes of the bike leg Michi slightly raised his cadence to 91-92 rpm and dropped power further to a very modest 265W (representing only 65% of his Critical Power). This had nothing to do with fatigue and everything to do with regeneration ahead of what is always a gruelling Ironman run for anyone on any day in any race. Michi arrived into transition with a very comfortable lead after a perfectly executed race bike split and even though this represented the fastest bike split of the day by a considerable margin (which lead to mutterings of him having pushed too hard) those of us who know his physiology and what he had been doing in training were able to watch the rest of the race in the quiet knowledge that it was already game over for every other world class athlete on the course that day. Well done Michi! 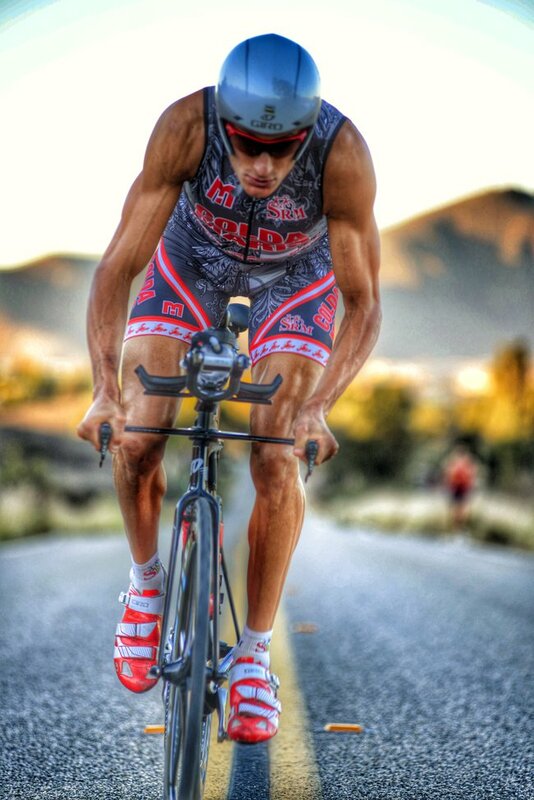 Michael Weiss trains and races with the SRM Shimano PowerMeter and PowerControl7. For more information on SRM product, news, and sponsored teams visit: www.SRM.de.